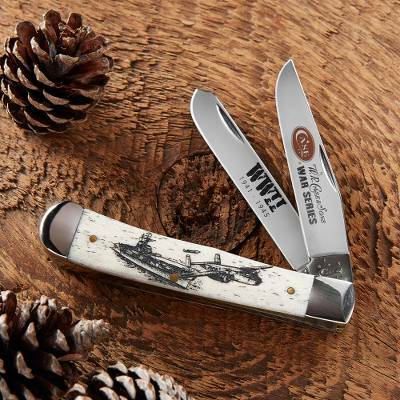 This natural bone-handle knife pays tribute to the US military veterans who served the Allied forces in World War II. A carved, scrimshaw-style bone handle features a sketch of a B-25 bomber taking off from the flight deck of an aircraft carrier. The pocket knife is part of W. R. Case & Sons Cutlery Co.'s Image War Series and features steel clip and spey blades.